The upcoming license changes to Office 365 Home, Personal and University is another step in Microsoft’s move to selling services not software. 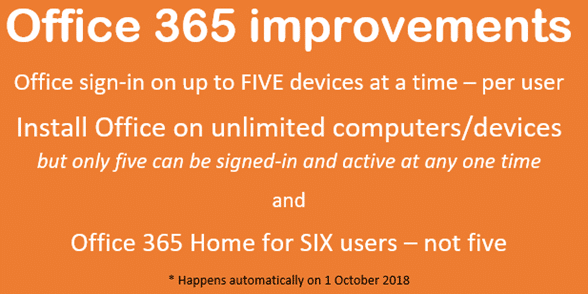 From 1 October, Office 365 Home, Personal and University users can install Office software on unlimited machines. For full use of the software you’ll have to sign-in to your Microsoft account (linked to Office 365 plan) which activates software. See Significant improvements in Office 365 Home, Personal and University for more detail. It’s a major change in the way we think about Office and what we get for our money. Over two decades we’ve all been used to buying Office software and installing it. The software came on floppy disks, then CD, DVD and now downloads but it was always a ‘tangible’ thing we received and installed. Each installation of Office counted against what we were allowed to use. To use Office on another computer, we often had to uninstall it from an existing machine. Immediately after installation, Office software would ‘phone home’ to check if it’s legal and allowed to run with all features. If not, Office would still work but in a very limited ‘Read Only’ mode. Microsoft doesn’t care how many times you install Office software under the new system. After installing Office software there’s no activation process. What matters is your USE of Office software not where and when it’s installed. The activation happens when you sign-in from Office. At sign-in, Office software checks your Microsoft account to see if you have a current Office 365 subscription. If so, Office will run normally with all features. If not, Office will stay in the limited ‘Read Only’ mode. You may have heard of ‘Software as a Service’ which has been Microsoft’s mantra for the last few years. The change to activation at sign-in is another step in that corporate plan. You don’t buy Office software, you don’t even rent/subscribe to specific Office software (PC, Mac etc). Like any service, you pay for what you use not what you have. Use of Office 365 services is counted by signing into Office software.